When first-degree price discrimination exists, the firm’s marginal revenue curve corresponds to its demand curve. Because a different price — the maximum price each customer is willing and able to pay — is set for each unit of the good, each unit adds its price to total revenue. So, marginal revenue, the change in total revenue, equals the price determined from the demand curve. The illustration shows a monopoly that’s using first-degree price discrimination. 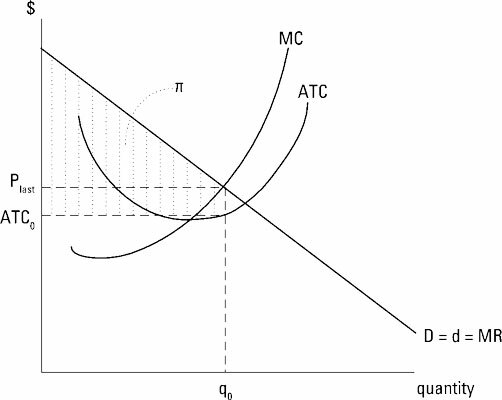 In the graph, marginal cost, MC, and average total cost, ATC, have the usual shapes with marginal cost passing through the minimum point on the average-total-cost curve. The firm faces a downward-sloping market demand curve that’s the same as the firm’s demand curve, D = d, given that it’s a monopoly. Because the firm charges every consumer the maximum price he or she is willing to pay, marginal revenue corresponds to the firm’s demand curve, d = MR.
Profit maximization occurs at the output level corresponding to marginal revenue equals marginal cost, q0. Each unit of output has a unique price, so Plast is the price only for the last unit sold. Every other unit has a higher price. The resulting profit for the firm equals the revenue it receives for each unit minus the average total cost per unit, ATC0. Because the price for each unit is the maximum price as determined from the demand curve, the shaded area labeled ð represents the firm’s total profit. First-degree price discrimination is virtually impossible to implement. First, the firm must know exactly the maximum price each consumer will pay for each unit of the good purchased, which isn’t likely. In addition, the firm must negotiate separately with each individual consumer, and be able to prevent resale between consumers. The cost of these negotiations is likely to far outweigh the benefits to the firm of first-degree price discrimination. Nevertheless, the closer your firm gets to first-degree price discrimination, the greater the benefits.